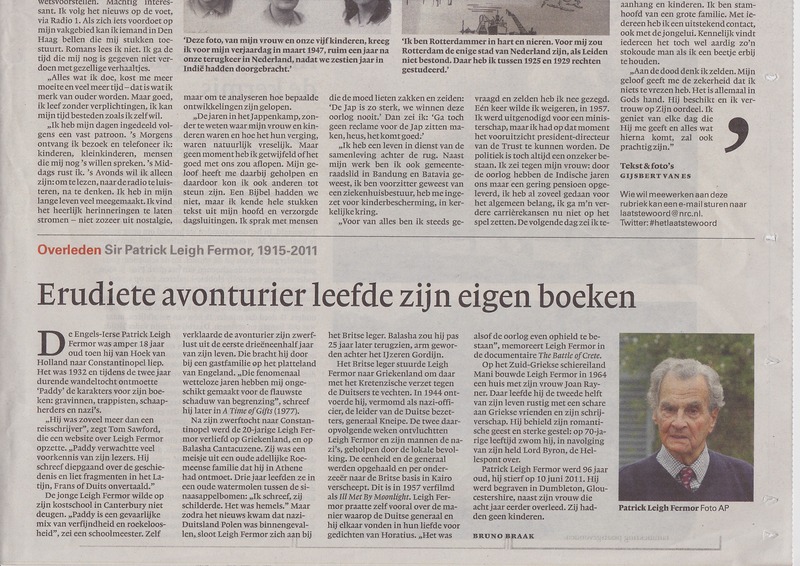 The leading Dutch newspaper NRC Handelsblad has published a short article to mark Paddy’s death written by Bruno Braak. Yours truly was interviewed for this and apparently I said ” He was so much more than a travel author”, says Tom Sawford, who made a website about Leigh Fermor. “Paddy expected a lot of knowledge from his readers. He wrote in-depth about history and parts in Latin, French or German untranslated”. The title translates as “Erudite adventurer lived his own books”. This entry was posted in Paddy in the News and tagged Patrick Leigh Fermor on August 18, 2011 by proverbs6to10.